There are certain norms that the society imposes upon us that we all willingly or unwillingly follow. The ‘log kya kahenge’ mindset still very much prevails. It defines a lot of unsaid rules that people follow, especially when it comes to our behaviour in public. A big part of it is how we dress up, look, and present ourselves in social settings. The beauty standards and the pressure to look a certain way is a reason for anxiety amongst many. We have been bombarded with ideas and ideal body images, features, and personality traits to flaunt. If we do not fit in, we will be judged! Here are some of the beauty standards and trends that baffle me completely! This is a big one. Fairer skin is perceived to be more beautiful than the naturally tanned or darker skin. Our society and, even our near and dear ones often bomb us with remedies to lighten the skin tone in order to find a prospect groom claiming tan is bad and so on! Even the media and advertisements portray women with darker skin tones as low in confidence. 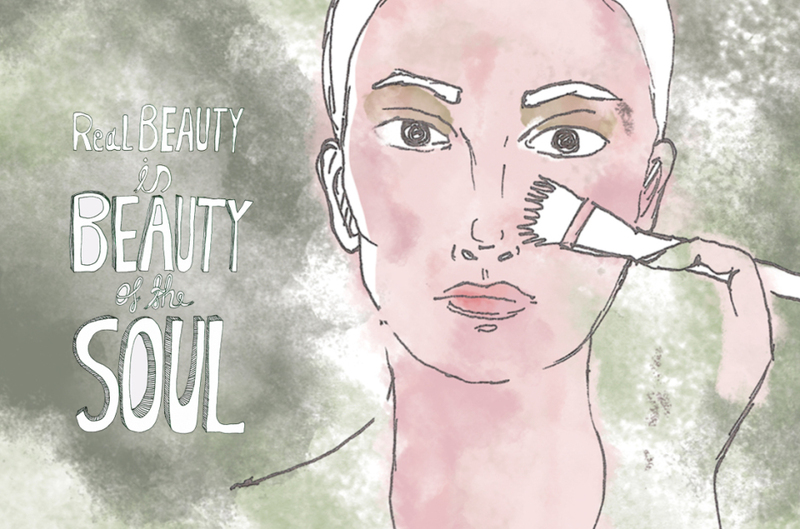 Skin tone should not be a beauty standard or a criterion to judge a person’s beauty. Growing up as a brown girl in an Indian household is a matter of anxiety for many young girls. However, change is gradually happening as few of the mainstream actresses are refusing fairness cream ads and young girls coming out to talk about the issue. A healthy body which exudes fitness and is pleasing to the eye is an ideal one. However, the pressure to have a curvy figure, just like the A list actresses or models that are picture perfect is insane. Often one is judged by his or her body image. Women, in particular, are expected to have a certain body type and be curvaceous in order to be likable. I have seen a number of girls crash dieting and even starving, going on crazy work out regimes to get that perfect body hip ratio, a flat stomach and lean legs. Yes, indeed, one must take efforts to be fit as it benefits the overall health of the body, however, it should not be done in a pressure to look a certain way. Long flowing black hair is considered a sign of beauty in women while short hair represents being less feminine. Choosing the hair style and the length is a personal preference. Being judged for it is something really obnoxious. This happens especially in the rural and suburb part of the country where girls and women are not even allowed to chop their tresses and maintain long hair. Also, waxing and shaving is a huge deal. Yes, keeping oneself clean is important and is hygienic. However, expecting us to be hair less is impractical because hair growth is a natural process and there is nothing gross about it. Ugly scars! Yes, that’s how it has been termed. I remember I had chicken box back when I was in college and it left some scars all over. A guy who was an acquaintance came up to me and jokingly commented, “Thank god I did not ask you out. You look so ugly with these marks, you are so ugly!” Do you think I am ever going to forget the guy and his comments? There are so many girls who are being called ugly because of the marks and the scars that they have may be due to pimples or other things. How people become so insensitive to other humans just because they do not look as per the beauty standards that are set by the society! The more covered up you are the better! Assuming things about women who are dressed in shorts as way to forward. Making up judgments based on someone’s appearance and dressing sense comes naturally to us since we are conditioned that way. Also, the media influences the minds and the thought processes in a big way. Again, what to wear and what not to wear should be a personal decision. There are many more such strange yet prevalent beauty standards in the society that we all deal with every day! Now, it is up to us how much we let it affect ourselves on a personal level! Meghana Pawar is a Professional Content Writer, Editor, and a Lifestyle Blogger. She is a personal growth junkie, currently working in Digital Media. She's a true bibliophile and a stationery lover! Being a meditator and a yoga enthusiast, Meghana also volunteers and supports pro bono work in this field of interest.